Portland Trust, a commercial real estate developer and asset manager headquartered in Prague, announces today that Building B at its Oregon Park office complex in the Romanian capital of Bucharest has won the 2018 CEEQA Award for “Overall Building of the Year SEE”. The CEEQA Awards, which recognize business leadership and achievement in New Europe real estate, said its award was based on Portland Trust’s ability to fulfil its concept of building high specification, efficient office space with a particular focus on low energy consumption in a green environment. 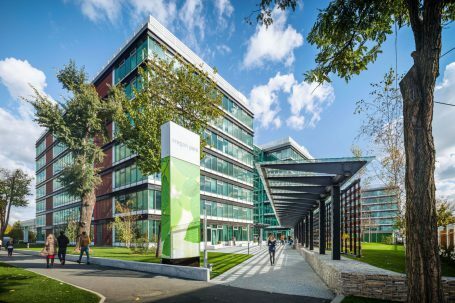 Building B at Oregon Park, completed in 2017 and covering 24,000m2, has been certified ‘Excellent’ by BREEAM, based on the development’s attention to the health and wellbeing of workers, energy efficiency, transport, sourcing of construction materials, and ecological use of the land. Building B is one of three independent office buildings at the Oregon Park campus which totals 70,500m2 and is built over two basement car parking levels, ground and six upper floors. The site cover is only 40% of the total 4 hectares, with the remainder set aside for communication and greenery, which allows for high levels of natural light to all the buildings. “Bucharest is enjoying property investment from all corners of the globe, including the Czech Republic. It is no coincidence that the likes of PPF, Penta and Portland Trust have made substantial investments in Romania over recent years and is now becoming a major market for Czech developers,” said Robert Neale, CEO of Portland Trust. “We are delighted that Building B at Oregon Park has been recognised by such a prestigious industry award as CEEQA. At Portland Trust we are dedicated to designing and building developments that meet the highest quality requirements in order to offer a better working environment for all our tenants,” he added.